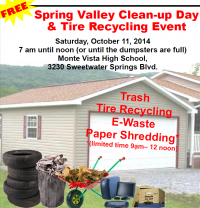 Tire recycling is open to anyone, not just Spring Valley residents. However only residential tires will be accepted (no truck or business tires). Tires must be reasonably clean of dirt. Preapproval is rqeuired for tires with rims or loads of more than nine tires by calling 1-977-713-2784. Please, no hazardous wastes (batteries, auto/cleaning fluids, paints, pool chemicals, etc.). 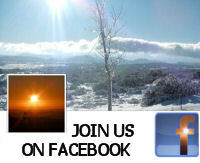 For more information call the Spring Valley Chamber of Commerce at 619-670-9902. This event is partially funded by a CalRecycle grant with support from the County of San Diego Public Works Department and the Spring Valley Chamber of Commerce.